If your school has decided to allow pupil and parent accounts for Class Charts, you are able to control what information is accessible for each account type. This can be used to hide detailed behaviour information from pupils but not from parents, or control how attendance records are shared. 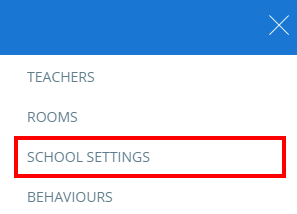 To choose what pupils & parent accounts at your school can access, click on the three lines menu and select School Settings from the list of available options. Next, click on the Pupils & Parents tab on the left hand side. Enabled: Parents & Pupils will be able to see the activity feed and behaviour breakdown graphs through their accounts. Disabled: Pupils & Parents will only see the behaviour breakdown graphs. Parents only: Only parent accounts will be able to see the activity feed and behaviour breakdown graphs . Pupil accounts will only see the behaviour breakdown graphs. Pupils only: Only pupil accounts will be able to see the activity feed and behaviour breakdown graphs . Parents accounts will only see the behaviour breakdown graphs. A preview activity feed can be seen below the settings in Pupils & Parents. Enabled: Teacher and lesson name will appear for each behaviour in the activity feed. Disabled: Teacher and lesson name will not appear for each behaviour in the activity feed. Positive only: Teacher and lesson name will appear for positive behaviours only in the activity feed. Negative only: Teacher and lesson name will appear for negative behaviours only in the activity feed. Selecting a date from this drop down box will only show behaviour activity from the selected date. Enabled: Behaviour notes will be displayed for behaviours in the activity feed. Disabled: Behaviour notes will not be displayed for behaviours in the activity feed. Positive only: Behaviour notes will only be displayed for positive behaviours in the activity feed. Negative only: Behaviour notes will only be displayed for negative behaviours in the activity feed. Please note: If Share activity feed with pupils and parents is set to Disabled, these settings will be hidden and disabled automatically. Enabled: Behaviours that were added through your MIS will be displayed in the activity feed. Disabled: Behaviours that were added through your MIS will not be displayed in the activity feed. Positive only: Positive behaviours that were added through your MIS will be displayed in the activity feed. Negative only: Negative behaviours that were added through your MIS will be displayed in the activity feed. Please note: If Show behaviour notes for shared activity for parents / Show behaviour notes for shared activity for pupils, Show behaviour notes for activity originating from MIS (SIMS, etc) for parents / Show behaviour notes for activity originating from MIS (SIMS, etc) for pupils are set to Disabled, these settings will automatically be disabled. Enabled: Behaviour notes that were added through your MIS will be displayed in the activity feed. Enabled: Parents and pupils can see the attendance records. Disabled: Parents and pupils cannot see attendance records. Parents only: Only parents can see the attendance records for their child. Pupils only: Only pupils can see their attendance records. 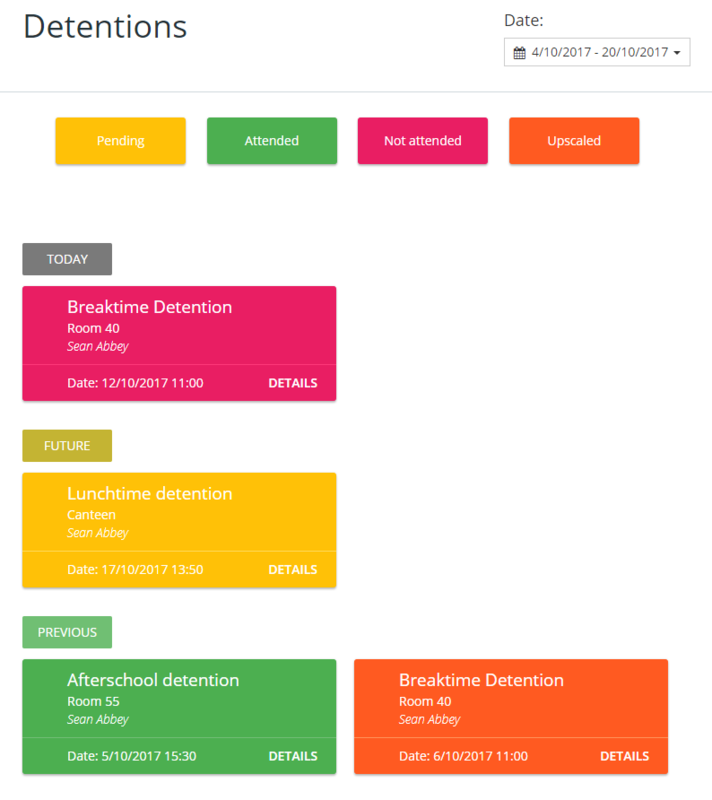 If the detentions module has been enabled for your school, you can also control how detention information is shared with pupils and parents. Enabled: Parents will receive email notifications when their child receives a detention. Disabled: Parents will not receive email notifications when their child receives a detention. Enabled, but without details (class and teacher): Parents will receive basic email notifications when their child receives a detention, which does not include the class name or the awarding teacher. With this setting enabled, teachers can optionally share the behaviour type which caused the detention with parents when awarding a detention. To find out more about this feature, check out its Knowledge base article. Enabled: Selecting this option will will display the detentions manager through both the pupil and parent accounts. Disabled: Selecting this option will disable the detentions manager for both pupil and parent accounts. 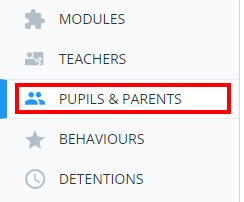 Pupils only: Selecting this option will display the detentions manager through pupil accounts only. Parents only: Selecting this option will display the detentions manager through parent accounts only. For more information about the detentions manager, check out its Knowledgebase article. 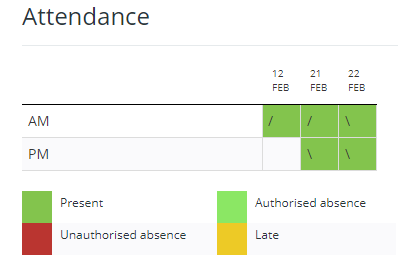 Enabled: Parents and pupils can see detentions in the activity feed. Disabled: Parents and pupils can not see detentions in the activity feed. Parents only: Only parents can see detentions in the activity feed. 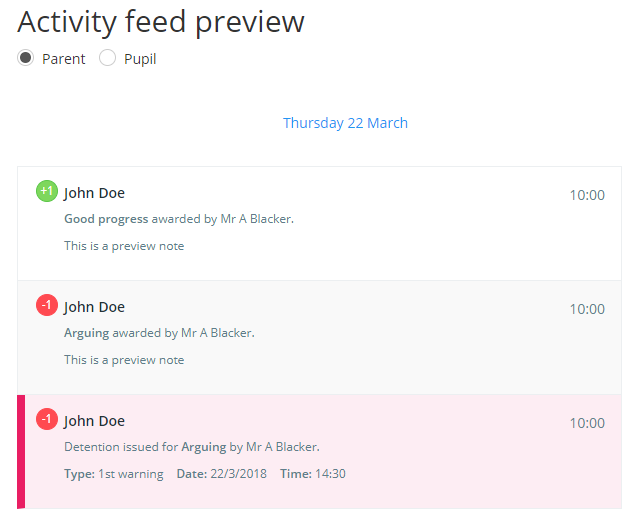 Pupils only: Only pupils can see detentions in the activity feed.